Part One of this tale, begins with a Promise. A Commitment. An insane one, really. Just over a week ago, I had a long conversation with my coach Jason Westlake about possibility. About opportunity. About not waiting, or hoping, or trying to make something happen, but just actually Doing It. To be frank, the conversation was about Money. About Income. And about how much I could make by Monday. And that number was… well, let’s just say, thousands. Believe me here folks, my past history of creating income through helping people work thru and solve problems, stretch themselves and enjoy the fruitful fulfillment of their dreams, has Not been lucrative. Just like most beginning coaches. And my coach last week, had been there too. (and now is highly successful!) He was coached thru those moments, by not believing he could do it, but being challenged to just make a hard-core, deep down commitment to Doing and Doing, until the thing got Done. But by Monday – IT HAD HAPPENED. And on Monday, as I discussed the selling of a motorcycle, the day previous, and flashed some dollars in front of my webcam, to my surprised coach, we dissected what had unfolded to make this happen. His assessment? My Sincere Internal Personal Commitment to the goal, had unlocked something powerful. The bike had been for sale for months, heck! almost years! I had people from craigslist texting every few weeks, and maybe a call once a month, but no one serious, no one buying. Until I had made a promise, to make this income happen, some way, some how. Won’t matter to me though. I know where my favor and serendipity come from. And I know that God smiled on my moment of ownership of action. My determination and focus, and help came in the simplest form possible and proved that modern day miracles can happen right in front of our very eyes! Have you been challenged lately? Has someone in your life asked you to really reach for something unbelievable? What would you say to an exciting and frightfully exhilarating request to do something AWESOME for yourself during a deep and trusting conversation? If you got involved with a good coach, you would face these things every session. And I Know you would absolutely astound yourself, with the results of your Commitments. Why did this bike finally sell? I think it’s because of an inner stance. An attitude. A confidence and a knowing. And this is something you can use right now, to improve any situation that is giving you stress and grief, or want to grow and transform in. Trying to sell a somewhat expensive toy, in an economy where people are not throwing money around like they used to, can make you feel like a sleazy car dealer. I used to get someone on the phone who was interested in the bike, and tell them all the cool things about it. Tell them how reliable it was. Tell them all I had done to make it custom. All this telling and selling begins to sound needy… And as my coach Steve Chandler says: Needy is Creepy. And not only does it sound creepy, but it’s weak, it’s hoping, it’s begging and pleading. No One Wants to buy from a beggar. It would feel like you’re making a mistake to purchase something that needs so much explanation. Custom Fenders, Paint and Exhaust – A couple small chips and a spot I’ll show you on the fender that could be fixed. I’ve driven it 10 years just like it is and gotten lots of compliments. What do you notice in this description? Does this sound needy, or weak or creepy? I don’t think so. You see, I finally came to a place of confidence in the real value of this machine. I KNOW it is a great bike. I KNOW it will run forever. 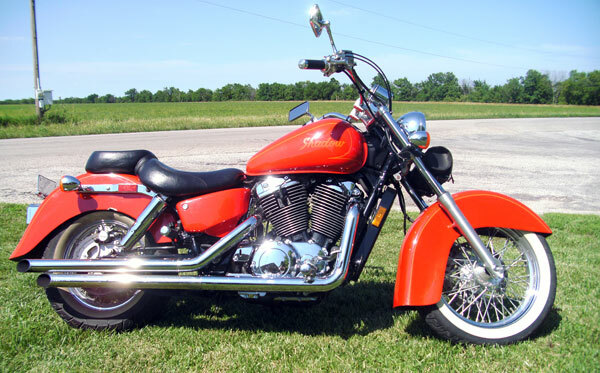 I KNOW that I put tons of time and money into making it the best looking, best sounding, most head-turning Honda Shadow out there. And, I had a Great Price on it, that made this an awesome buy for the person who did pick it up. These are things that I KNOW. Why do I need to sound like I’m begging someone to purchase my bike and have a killer ride at a great price. It was really up to them, if they wanted to go for it, or not. Their choice. Either way, didn’t matter to me anymore… Someone was going to get an awesome deal! And that attitude is something you can apply to yourself, your value, your custom looking, great running, well maintained machine of YOU. Take this confident (but not cocky) emotion and put it on right now and wear it like a new set of clothes. I have, and it’s been an awesome week. This red shadow served me quite well over the years. I had thousands of miles of fun with it. It’s last lesson, I believe will be worth much more than the few thousand I sold it for. Credentials include: Snazzy debt-freedom, Firsthand experience making “The Leap” and One-One Work with my own World Class Coaches. My life’s not perfect, there are several dents, dings and a spot I’ll show you on my career path that could be fixed, but I’ve driven it 33 years just like it is and gotten lots of compliments. And when you email or text (or better yet, call), which would make you ballsy, tough and just crazy enough to possibly be up for this kinda change… I will try to get you off the phone. I will try to tell you that this isn’t for you. I will try to tell you that someone will be getting this deal, but not you… Not unless you’re REALLY SERIOUS, and that neither of us have time to waste. Because I KNOW how awesome the feeling is going to be when you decide to invest in yourself, and make a hard-core, deep down commitment to Doing and Doing, until the things get Done, that will give you the exhilaration of a life that is now only in your dreams! I did it on Tuesday. I was halfway through a coaching call, when on the other end of the Skype connection, I hear and see myself talking from 2 years ago. The voice came from a different person, and sure, he has a wife in his example; but it was just like my words, my thoughts and emotions had been recorded and replayed. Then I remembered a song! I sent it to my coaching client. Although, it came with a strict warning. Play it once and then delete it. It could change your life forever. It may have mine? These are the lyrics that got me so fired up! WOW! I can’t believe I’ve forgotten about the song! So, this was the actual moment of Time Travel. Somehow in the last two years of living, I’ve had the idea in my mind, that I turned everything in my world upside down in search of small business success. Or that I wanted to help more people. Or maybe to prove that debt-freedom gives unparalleled flexibility. Or how about, that every man wishes to break free and head West, and since I had the opportunity, I was going to do it, by God! BUT!! BEING BORED TO TEARS, WAS THE SPARK! I can’t believe I had forgotten that! So, after the coaching call was over, I began to play that song. I let it repeat, over and over, over and over. And I cranked it up louder, and Louder, And LOUDER! I began to time travel. My brow bent into a deep furrow as the beat bobbed in rhythm. A snarl-curl of nasty attitude masked my face. Just a real rock’n-roll smile would be a better description. Then those heavy-handed scrapes on the guitar strings hit my soul. That smack on the drums popped my mind open. The lyrics screamed my old crusty silent thoughts into the high decibel present moment. The insane volume crackle-busted my little computer speakers. Finally, I just let loose in an all out stomp-dance! Stuff was shaking off the walls, all through the house! Wow, they say that hindsight is 20-20?? Damn straight!! It just floored me, that this huge monumental moment in my life, had been completely forgotten. I have pointed to all kinds of catalysts, reasons, dreams and fantasies about why a person would come to this point in their life. The truth was that it started with a bunch of tiny broken records, spinning year after year all throughout my habits, actions, work and life. The soundtrack they made was as familiar and comfortable as it was annoyingly repetitious. Then a couple major earthquakes knocked it off track, and I woke up and noticed that I was bored to tears! I guess that’s for you to decide. Just like every week, I say something that hit me, something profound, to me, and that means jack squat. Cause, art is about YOU, and how YOU interpret it, into your world. Okay, so what would be the moral then, for me, of this little tale? How could a person literally forget something so important to them, that they would drastically shift their life around and all out of whack for it? One who tells stories and anecdotes with skill and wit. While Thud-Thudding, Thud-Thudding on the treadmill at the resort last week, I saw something amazing. I witnessed a profound universal truth, in real life. Everything I saw through the window of the gym in Tucson was amazing early in the morning. There were lush and artistic landscaped sections of sticky cacti. There were spots of sodded grass and stucco buildings and pretty man-made stuff. Beyond that were more impressive works of art; Mountains. Wild Cacti. And More Mountains! Nice scenery to keep you going, But, that is not the amazing thing that I saw and learned. Since the machine was planted right up against the full length plate glass, I saw my own reflection. The reflection I saw was partially covered in shadows, which made parts of me dissapear. The reflection I saw, didn’t show the whole me, that I knew was there. I was wearing a baseball cap, the brim made a shadow, and so in my reflection, it looked like I had no eyes. The treadmill itself covered up my lower body, so only my red shirt, a few spots of beardy face, my headphone wires and most of my hat showed up. My hands were bouncing up and down with my jog, and as they flashed in and out of my peripheral vision, they were the only glimpses I got of my tangible self. While exercising on a moving rug of rubber, you gotta stay focused, (or at least I do) and so, I stared at this reflection for quite awhile. Then I began to wonder… What if I looked at this reflection so long, that I believed myself to be, the image that I saw in this ‘shadowy partial mirror’? And I mean, Really believed it? Uh oh! I HAVE believed this partial reflection of myself, to be myself, many times in my life! Let’s think about the guy who walked up and heard this answer from a seemingly normal person on a regular ol’ treadmill. What would his response be? I’m merely pointing out that so often, from our perspective, we can’t see or understand the true version of ourselves. It is based partially on what we think we are, partially on what we’re doing, and then mixed up with a cocktail of emotions, that can color the whole recipe differently from day to day. So, are we even qualified to truly understand ourselves without some kind of objective outside perspective?? I don’t think so. And that is why I have a coach. See if you can find the point in this clip, where my treadmill metaphor comes into play. I can see that quite clearly. 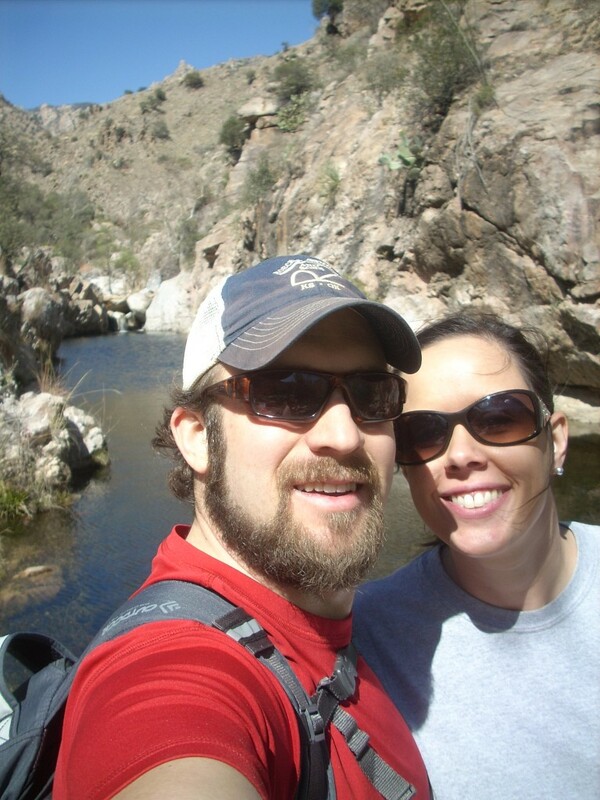 On my second day here in Tucson, Arizona, Lindsay and I took a walk. It was actually a hike. 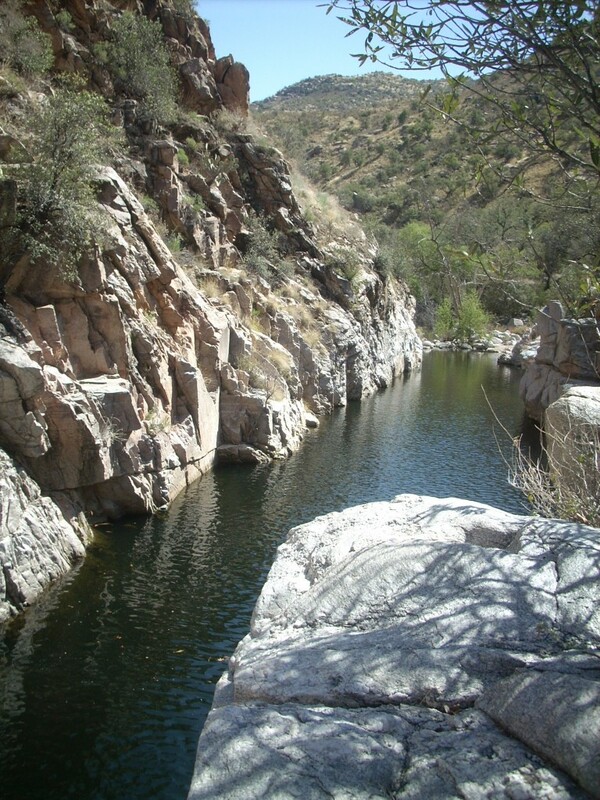 In Sabino Canyon, they offer a tram ride up a beautiful twisting narrow creek companioning paved road and will gladly pick you up in several spots on the way down. It’s a neat 4.5 mile clip up to the top at stop #9. Although for us today, we used that last stop a starting point and “walked” another 4.5 miles into the canyon to a beautiful little spot called Hutch’s Pool. Immediately the starting point of this trial was a tall wall of switchbacks high above the canyon floor creek. From that point, the trail snakes along the ridges and vees and rises and valleys. This trail is MUCH different than the Paved Road. When the path is so narrow, the sides so steep and the footing so erratically rocky, you must be mentally present for each step. You gotta slow down and think. You gotta get good at immediately noticing the next best step and confidently taking it while your momentum is working in your favor. There were only a few other people we met up there. Actually mostly older and wiser groups than us. They were better equipped. They were in great shape. They were quite helpful and all of them were in awesome appreciation of the scenery and the opportunity to enjoy it. Finally finding the Pool was amazing. It was worth every step. There is something magical about a destination that you work so hard to get to see in person. We had a picnic, on a big rock at the head of a waterfall on a fantastically beautiful day, alone, miles from anyone or anything made by man. We did however know the lay of the land better, and actually made a quicker time back, than our trip out, and felt more aware of all the awesome scenery around us, now that we’d already taken these steps one time before. Our teamwork was in sync, and motive of the Hot Tub at the resort, a wonderful prize to reward our return home. By the time we got back, I had injured myself. I had pushed very hard, and found my weaknesses. I had exhausted muscles, creaky painful knees, and literally was bleeding in unusual places when it was all said and done. And was ecstatic to have had the experience of it all! Oops!!! I’ve made a mistake. Today I am thankful, that I am no longer on the Paved Road. It’s true, and you know that if you read this blog. The real reason I’m in Tucson is to attend an event as a member of the Coaching Prosperity School. In less than 12 hours, I’ll be in a small group, working with coaches, leaders, and well known authors, that I have a bunch of respect for. We’ll be working together, getting real, getting uncomfortable, stretching and growing ourselves, in order to help our clients do the same. It will be painful, it will hurt, and I expect to be challenged along the way. Question for the Week: Where in your life, have you left the paved road, and set out to blaze your own trail? Tell us all, how it was worth every step, and thanks again for being here at weirdforgood! An elderly woman sits at a dinner table, in a bustling room. Actually, it’s a little past time. Everyone else in the dining area is almost finished and yet she hasn’t started. Her son walks in. He’s paying a visit to his mother in the care home where she now lives. He’s a little confused as to why she isn’t eating. He’s worried, but doesn’t sit down with her right away. A nurse walks close by and he asks the woman why his mother isn’t eating. Has she been sick? Does she not like the food? Is something else wrong? The nurse looks in his eyes, and quietly says, “She’s forgotten how,” and moves on. Deflated and concerned for his beloved mother, the son sits close with her at the table. He notices, she has her fork in hand. She even has a morsel resting on it. Her mind had lost an important part of the process; it was simply unavailable for instant recall. My Sunday School Teacher, Bill Ballinger, then gently guided his mother’s hand and arm up, and helped her remember how the motion of eating her dinner worked. Although he was heartbroken, she regained this simple lifelong ability for the moment, and began to devour her plate. She was happily eating away and enjoyed the meal immensely. She had been quite hungry, she had been trying, yet this one little step, was blocked. Although sad, this story that Bill shared one Sunday morning, really touched me. I put myself in both of their places, and felt compassion for the weightyness of such a simple moment. He no doubt, felt sorrow for the progression of her condition, yet he got a great glimpse of her inner resolve, her innate hunger for life, and how simply reminding her of something she already knew, made all the difference in her world. Coaching can do that. Sometimes it can be nothing more than reminding someone of what they used to know about themselves. Something simple, and powerful, and maybe obvious to everyone else, but for them, (as it has been for me) it can blocked and forgotten from the mind. For the last month or so, I’ve been working on a presentation. This presentation will first be given at a meeting of the Young Professionals of Franklin County. And, this presentation will be available for free, to your business, your civic club, your small group at church, or even just a group of friends. In the last couple years, you know that I’ve been on a personal journey. I’ve changed a lot. I have started and stopped several versions of this presentation. I’ve made handouts and graphic flyers, yet something inside me, isn’t sure I’m on the right track. See, the metaphor is powerful, yet I’m not really hungry for food, and the food’s not for me. What we’re really getting at here is what context and what content could a presentation I give, nourish the world around me, and specifically, your world? You weirdforgood folks are with me week in and week out. I appreciate your readership. Today, you have a chance to shape and guide my projects and possibly bring this package to your place of business or your organization. So guide me, and show me, what it is that you consider important. What is just as important as food to the hungry, that you feel I could offer, in this presentation. Your ideas, will be collected, they’ll be treated with great care and appreciation. Understanding the needs of my community, your community, your world, is a much more poignant connection than me imagining, what I think you’d like to hear. It’s no secret that I’ve had dismal results talking about certain issues like debt reduction. My goal with this presentation would be to take your instinctive gut reaction to this question, and pour myself into a truly creative work. The speech could encourage, educate, inspire and most importantly provide tools to get real results, on the topics you’re concerned about. I trust that you’ll give me your honest opinions and with enthusiasm, I’ll be working on somebody’s important ideas soon. I hope you’ve put in your two cents at least! To reiterate, if you could assign me a project to create a speech/presentation on any topic you feel would be important, helpful or interesting; and that I may be able to offer insight on. Please post it in the comments section below. Once I’ve received feedback and compiled my presentation, you certainly will be able to bring this package to your organization free of charge, and I would appreciate the opportunity! !